8th class pass. 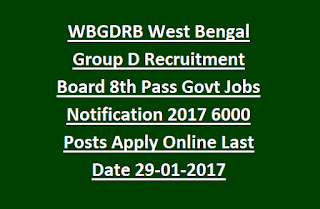 There are total 6000 vacancies available in this current recruitment of West Bengal Group D Recruitment Board. Selection for these WBGDRB Group D jobs will be based on objective type multiple choice written exam and personal interview. Candidates who are qualified 8th class and having within age limits they can apply online through official website of WBGDRB @www.wbgdrb.in or wbgdrb.applythrunet.co.in on before the closing date of 29-01-2017 before 11:00 PM. For more details regarding this Group D Jobs in West Bengal age limits, Salary, qualifications, online application procedure and more information is given below. There are total 6000 vacancies are going to recruit through the WBGDRB Exam. The candidates age limits 18-40 years as on 01/January/2017. The Upper-age limit is relaxed for BC candidates for 3 years and for SC/ST candidates 5 years. The candidate must have passed Class 8th Examination from any school under the West Bengal Board of Secondary Education or its equivalent recognized Board. Selection for this West Bengal Group D vacancies will be based on Written Test, Interview, Character Verification of Candidate and Medical Examination. Written Exam will be conducted for 85 Marks. Exam will be objective Type multiple choice only and having 4 choices for each question. Each question carries one mark. Exam time duration is 1.30 minutes. Written Exam New Syllabus for WB Group D Jobs is 8th Standard Syllabus of above given topics. Candidates have to apply through online only. Before applying online kept ready for scanned copies of Recent Passport size photo and Signature copy in JPG format as per the given sizes and provide valid Mobile number and Email Id for future communication with West Bengal Group D Recruitment Board. 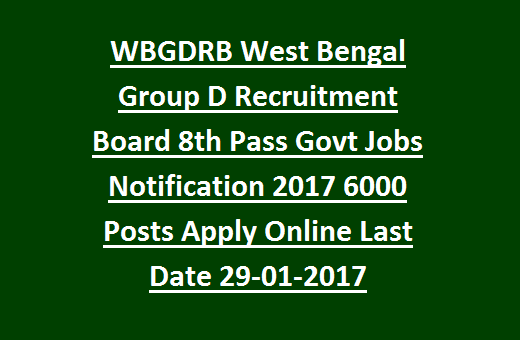 Download official notification here for West Bengal Group D Jobs Recruitment Exam.